How is a book made and published? What is publishing? What is the Oxford University Press? All these questions about books, publishing, and OUP can be answered by a visit to our Museum. Oxford University Press has been publishing books for over 500 years, ever since it came into existence in 1417. OUP is responsible for printing and publishing one of the most famous fairy tales for children, Alice in Wonderland. Children get first-hand information about how a book comes into their hands. They can learn about ancient writing materials and how books first came into existence. They learn about Oxford University Press. 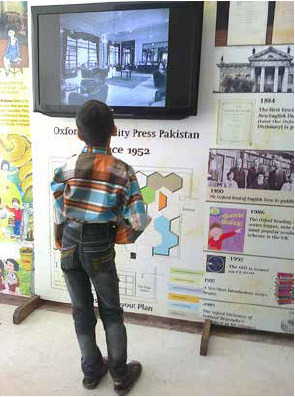 They also learn how OUP came to Pakistan and what they do here. A special Children’s Corner in our Museum entertains them by showing which books are written specifically for them. The Children’s Wall showcases all the characters that have been created for entertaining and educating children. The Museum has been designed keeping in mind our young audience which is why we have various interactive displays and changing exhibitions to engage children’s interest. Activities such as storytelling and art and craft will be organized for children to involve them in the Museum. We invite you and your students to come and see the Museum. It is our responsibility to ensure that you learn a lot and have fun! Please book school trips by filling out the Reservation Form with all the required details. School Tours must be booked at least a week in advance to ensure that we can provide your school the best experience. School tours can also be booked during summer vacations during the official timings. Students will be divided into groups of 10. One teacher/chaperone will be in charge of one group. Requirements for access for disabled students or special needs students should be specifically mentioned in advance. Different classes should be mentioned separately. All students should be briefed on the basic rules and regulations BEFORE coming to the Museum. Children should be taught the importance of the museum exhibits and archival documents and their value to ensure that they do not inadvertently damage them. Large bags and/or backpacks will not be allowed inside the Museum. Food and drinks are prohibited. Running, shoving and/or any other physical activity should be prevented by the teachers/chaperones. All school groups are requested to arrive at least 15 minutes before the allotted time to ensure ample time is available for viewing the different exhibits.